The off-white Bogen Communications SM4T is an Easy Install series 4W surface-mount speaker in a lightweight ABS plastic shell offering intelligible voice reproduction for paging, talkback, and security applications in schools, warehouses, offices, and more. 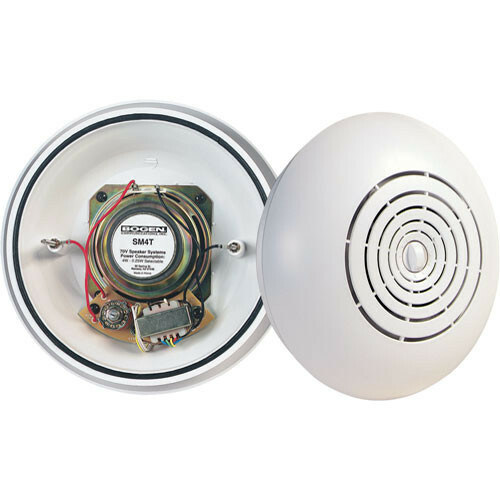 This multi-tap speaker is compatible with 25 and 70V amplifiers, and delivers a maximum power output of 4W across a frequency range of 125 Hz to 15 kHz with a 120° dispersion angle. A rotary switch grants access to five power tap settings. Easily wire the SM4T using the color-coded mounting studs, and adjust the volume via the front-mounted knob without having to remove the speaker. Mounting hardware is supplied for simple, tool-free installation. Box Dimensions (LxWxH) 10.3 x 10.2 x 5.75"
SM4T Easy Install 4W Surface-Mount Speaker (Off-White) is rated 5.0 out of 5 by 1. Rated 5 out of 5 by nbarnez from Easy Install PA Speakers These are the easiest speakers to install in a drop ceiling and they look great!!! They can be used on a 25v or 70v amplifier and the audio output adjustments are switchable. Great product for the money!! !